Since my last post, I’ve been flying around the District like never before, visiting schools and hospitals and winning mascot basketball tournaments. Yes that’s right, not only can I play baseball, apparantly I’m a natural at basketball as well. 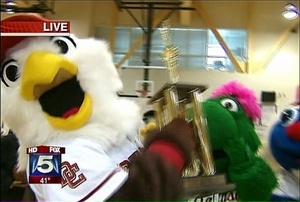 The other day I entered the “Fox 5 Mascot Madness” tournament that was televised on Fox 5. At the start of the tournament, I was ranked as the number 2 seed, only behind G-Wiz of the Washington Wizards. I won my first two rounds and then matched up in the finals with no other than G-Wiz himself. The crowd at Bethesda’s high school was cheering with excitement for what they new would be an intense matchup. As predicted, the score was close but I was able to win the matchup 7-3 and took home the trophy! I couldn’t believe that I had won the championship! Neither could G-Wiz apparantly as he threw a “cheap-shot” punch at me which I will surely gain revenge on in the future! Either way, I was very happy to bring the hardware and bragging rights back to Nationals Park! Hey everyone and thanks for stopping by again! I can’t even explain how great the month of March has been to me. I’ve been able to meet so many people for the first time with my new look! Last week I showed off some of my basketball moves at a Red Cross fundraiser at the Thomas Jefferson Community Center in Arlington and was able to meet some really cool people! 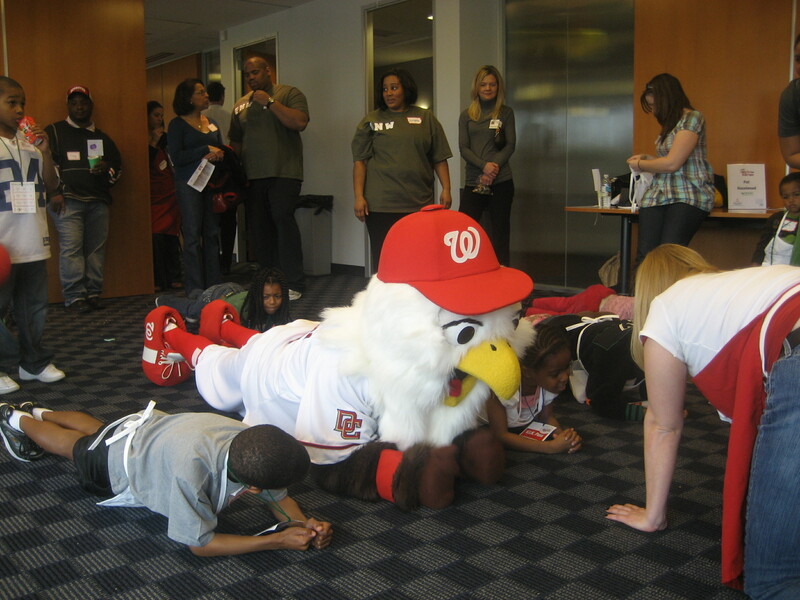 That same day, I visited the George Washington University Hospital for an event called “Kids in the Kitchen” in which volunteers stressed the importance of staying healthy to all you young ones. 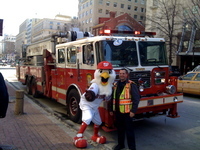 The next day I helped the firefighters of Engine 21 celebrate their 100th anniversary! The guys provided everybody barbequed lunch and drinks, but I was just fine eating all the gummy worms I packed! Recently I stopped by Hard Times Cafe in Clarendon where I met with some diners and ate a delicious bowl of chili. Those guys at Hard Times sure know how to cook! This weekend was no different as I stayed very busy. Saturday I was at the University of Virginia where George, Tom, Abe and Teddy raced at a lacrosse game. The race was close but hometown favorite Tom came out with the victory. Teddy, of course….lost, however I have a feeling he may be in line for a victory real soon! Sunday I marched in the Saint Patricks Day Parade with all of the presidents. I wore a kilt and soon realized how drafty those things actually are!!! I love parades and it was a great way to celebrate Saint Patricks Day! It’s been a busy week for me, and boy does that make me happy. I’ve been running around town so much meeting so many Nationals fans, it’s no wonder I’m skinny now! On Tuesday I spent my day at the Metro Center and Farragut North metro stops with my fellow Nat Packers to meet with fans and pass out pocket schedules for the upcoming season. 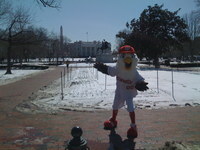 The day was cold, but the thought of baseball made me all warm inside! I was so happy to receive all sorts of comments on my new, slimmer look! 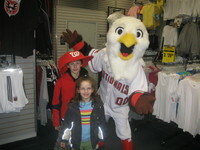 On Wednesday I visited Modells Sporting Goods store in Bethesda. That store is like a candy store…..I wanted everything! I spent a lot of my time checking out some new baseball mitts and bats for the upcoming season and met some Nats fans that stopped by. 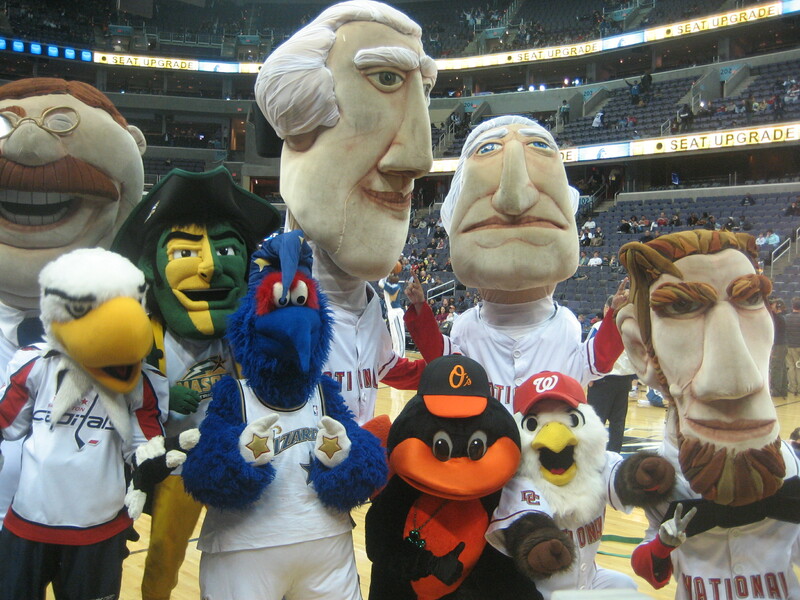 Thursday night was a lot of fun because I was able to hang out with my cousin Slapshot at the Verizon Center for the Capitals game against the Maple Leafs. I helped Slapshot ref a “mites on ice” game that took place during intermission. Even though the Capitals lost, their fans were great and really appreciated me coming. 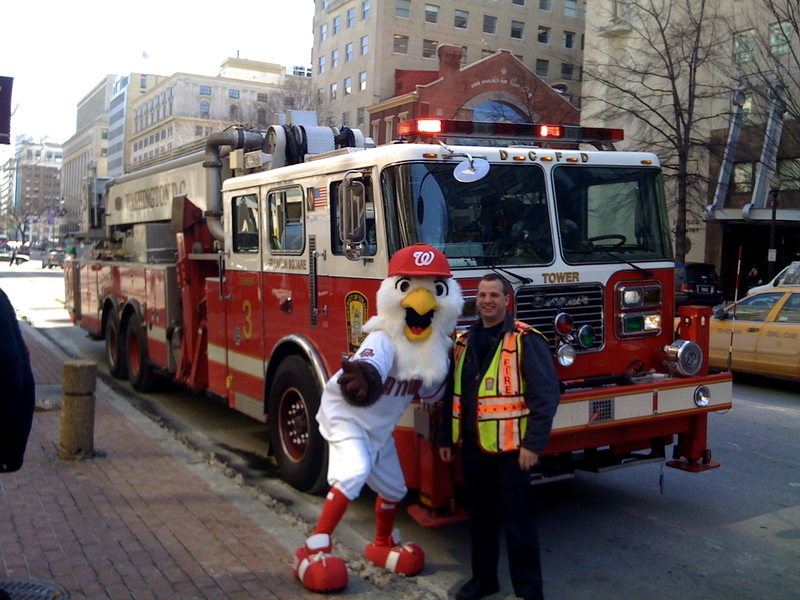 After the reffing, I watched some of the game and had a great time “rocking my red!” Today I spent my day infront of PNC bank in North East DC and had a great time waiving to all the cars that passed! Thanks for stopping by my blog again, and look for me in the community these next couple of weeks. I’ll be out there all the time, these wings don’t stop! As I’m sure you’ve all noticed by now, I’ve been doing a lot of growing up lately! I’ve been getting older (I’m a teenager in bird years), skinnier, and taller and boy am I loving it. While I was transforming into my new look I’ve been staying out of the public eye. But today, I was ready to reveal my new self! This morning I was on the fox 5 morning show where I was on tv! It was a lot of fun to be on television and boy are those lights in the studio bright! 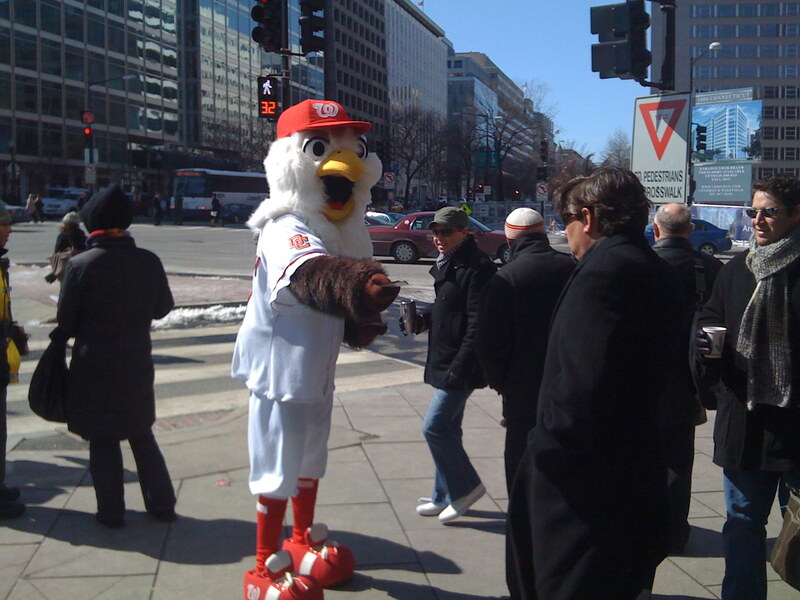 From there, I was off to the ESPN Zone where we had the official “unveiling” of the new me. Once there, I danced to a montage of songs infront of a crowd. The crowd all loved it, and it was at that point that I new everyone would LOVE my new look. Later today, I was off to the Childrens Hospital where I was able to meet many special children. It felt great to brighten the days of children who are sick in a hospital. 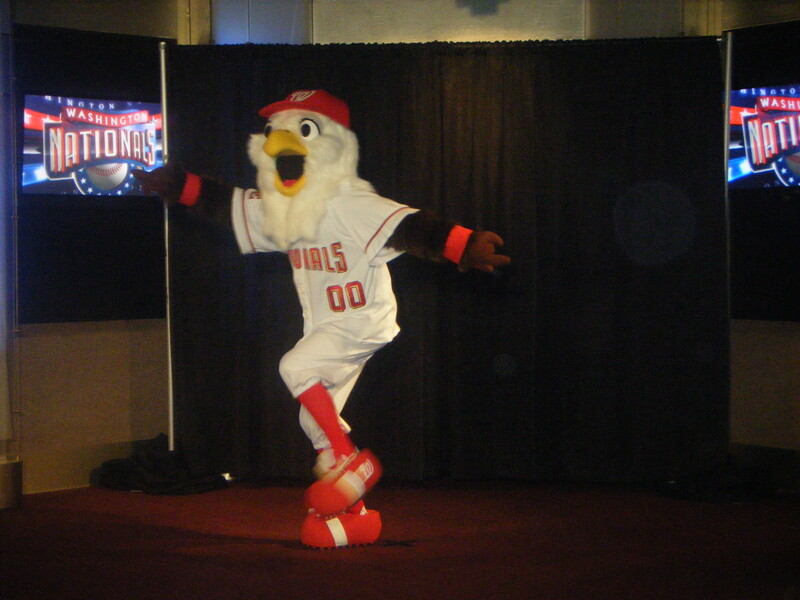 Look for me to be out in the community a bunch in March and I can’t wait to show you all my new look in person!